There are three types of sports fans — which one are you? Now this is a super crazy fan. This past week I woke up in the middle of the night to watch the Oakland A’s play their first two regular season games in Japan. It was not very smart for my health as my sleep schedule was thrown out of whack and I might have probably lost some muscle with my weird eating schedule. But it was something I knew I’d do again if it came to it because I am a fan of the Oakland A’s. 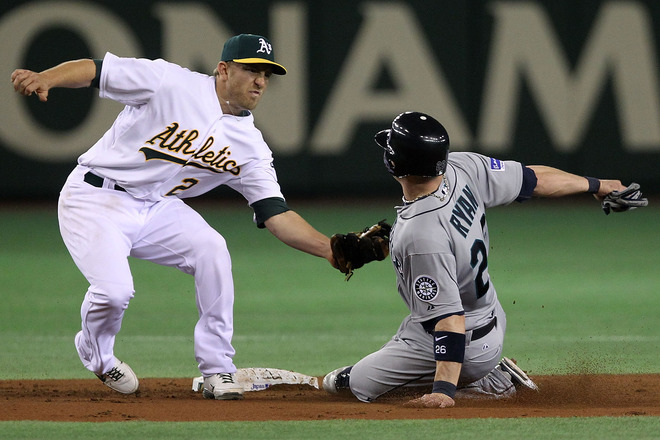 In fact, the A’s are the only team I think I can honestly say that I am a die-hard fan of. Baseball is my favorite sport and the A’s to me has become the team I invest the most time, money and effort in. Thanks to Niners Nation for bringing this to my attention. ESPN has Brandon Weeden on set and they're asking him to guess if he's older or younger than assorted #NFL veterans. What an awful bit. Weeden is a 28-year old NFL draft quarterback prospect and his age is a concern. But is it necessary to do this to him? It’s not like he’s hold and unable to throw a ball. He spent the early part of this 20s playing baseball before enrolling at Oklahoma State in 2007. This is the kind of stuff that I expect better from ESPN but at the same time, I am not surprised. ESPN has been criticized for their around the clock watch of Brett Favre and Tim Tebow in recent years and has caused unintentional stirs. Age is an important part of Weeden’s profile — but not like this. This was tweeted earlier today. 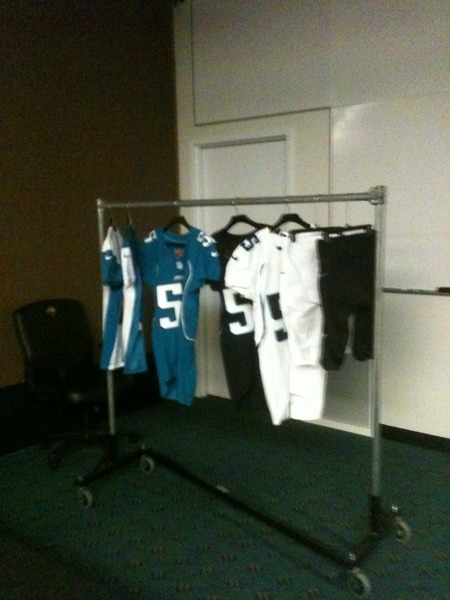 And if you have trouble seeing it, here’s the actual image of the new Jaguars Nike uniforms. It was reported earlier that the Jaguars would add black in 2013 but it looks like it will make its return for this upcoming season. It’s a little plain but we’ll see how it looks live. There are a few things to notice in this photo. The first thing you see are the two jerseys on the far left. Those will be the practice jerseys. It looks like it has some serious side piping down the side. I really don’t care too much for practice jerseys but I usually like them to be one solid uniform color instead of a two-tone. Nike had said that they wanted to just adjust the template and fabric of the jerseys that weren’t going through a design change. It looks like the seem for the side piping is getting a slight readjustment and it looks a lot better already. 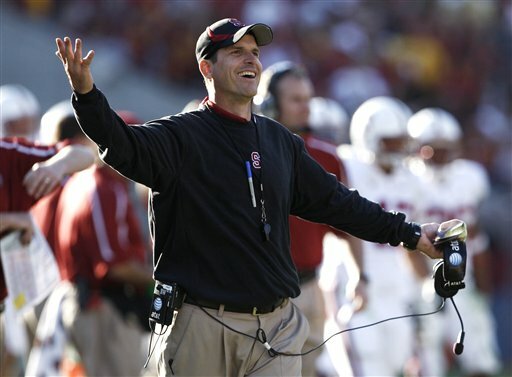 In his final season at Stanford (a Nike school), Harbaugh was already wearing his version of a black sweater. On April 1st, Nike will become the official outfitter of the NFL and all previous products, uniforms created by Reebok will no longer be in use. The change in supplier means that every aspect of the team will be made by Nike. From uniforms to shirts, Nike will be the outfitter. There has been buzz as to what the Nike takeover will do to the uniforms but there is one thing that will see very little change on the 49ers’ sideline — Jim Harbaugh’s infamous black sweater. Despite the change from Reebok to Nike, Harbaugh actually already has a history wearing a Nike black sweater. In his final year at Stanford (a Nike school), Harbaugh donned Nike’s version of a black sweater and black cap. Much like the Reebok sweater Harbaugh wore this past year, it’s all black and features a simple team logo. Pennington did OK on defense, but was close to a homer in extra innings. I can’t believe that I woke up from a three-hour sleep to catch the A’s-Mariners game. After all, it was Opening Day and the A’s are my love. But I knew that even though I had a lagging online stream, I could listen to the radio. I wouldn’t do this kind of stuff for any other team. But here I am sitting in my kitchen listening to this game. The A’s were exactly what I thought they would be today. They would keep it close with a great pitching performance and the offense did produce. But it was the missed opportunities that cost them. You can use this as your Chrome browser theme. Over the weekend I worked on this little thing with my Google Chrome browser. 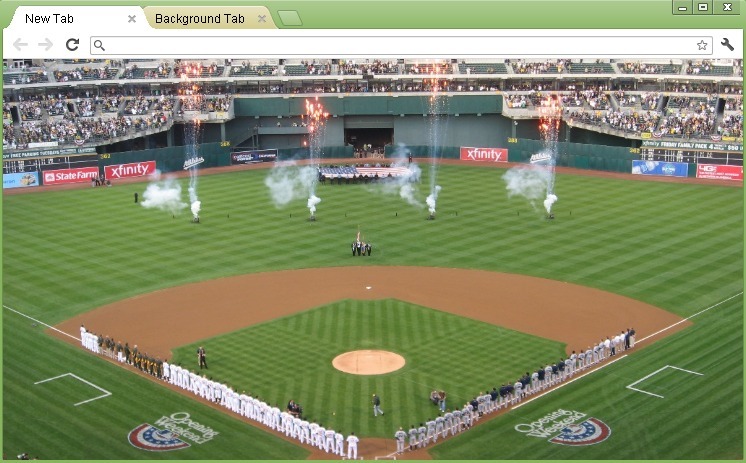 You can customize your own browser and since I am a huge A’s fan, I decided to take a photo I took of Opening Day last year and put it into a theme. What do you think? Feel free to use it if you want by going to this link. If you want to create your own, head over to this link. Show me what you come up with! I came across this video and just wanted to share it with you. As you know, I am a baseball cap collector but I don’t like buying fashion caps. I only like buying caps that were used for on-field play. Unlike this guy, I am very picky and I don’t need to own a cap for every team. But for this guy, he owns every New Era cap ever made for any baseball team. This is his first video and he plans to add more. I just have to say WOW and good luck to you sir on your adventures.